Haiti's singer-turned-president is returning to the international stage. 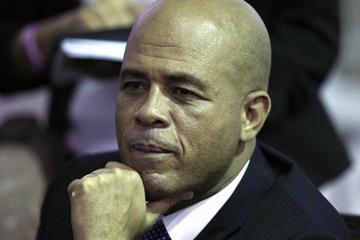 President Michel Martelly will sing two songs with Spanish singer Julio Iglesias at a benefit concert Friday in the Dominican Republic. Martelly has made several impromptu performances in Haiti since he was elected in May 2011. But the show in Casa de Campo will be his first performance outside Haiti for the artist known as "Sweet Micky." Concert organizer George Nader says proceeds will go to the Pink and White Foundation, a charity run by Martelly and his wife, Sophia. Among those expected to attend are Henry Kissinger and designers Donna Karan and Oscar de la Renta. Martelly was known for often bawdy performances before he was elected president of a country struggling to recover from a January 2010 earthquake.